Two teachers from Kohima Science College, Jotsoma designed and developed a portable manual rice threshing machine to reduce physical stress and time spent during the threshing process. 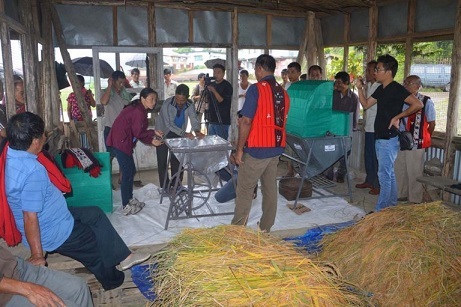 Assistant professors Samadangla Ao of department of botany and Bendangwapang of department of mathematics of the college introduced and demonstrated two of the machines at Mopungchuket village in Mokokchung districton Saturday. Assembling and operation of the machine were demonstrated to the villagers. Made of locally available materials, the inventors named the machine as ‘Agro Compatible Technology Rice Thresher or ACT Rice Thresher’. The machine is pedal operated with an alternative option for hand operation. It is specially targeted to serve rural farms where there is no electricity and does not require fuel to operate. The machine can be dismantled into separate parts and easy to assemble for ease of transport so that multiple farmers can share it. “It is introduced to the farmers with hope that it will cut their labour costs for threshing and save some time to engage in other post-harvest or household activities,” Samadangla and Bendangwapang said. “Through this introduction we wish to encourage the local entrepreneurs to recognise the current need for mechanisation of agriculture in Nagaland by developing compatible technology for efficient and improve food production,” they said. The two assistant professors said their project was not for profit or commercial venture. They hoped that farmers and local entrepreneurs would observe their threshing machine and replicate them. Commissioner and secretary, Nagaland works and housing department, Bendangkokba, along with contributions by local entrepreneurs Chubanungsang Imsong, M/S C Steel Fabrication, Kohima (metal works), M/S Sagar House, Kohima, M/S Bearing House, Dimapur and Artain Enterprise Pvt Ltd, Dimapur, funded the project. Mopungchuket Village Council chairman Aosadang thanked Samadangla and Bendangwapang for their work and also conveyed appreciation to the sponsors.